You know the S-Video connector… it was the primo way to connect your VCR to your huge standard definition TV back in the 1990s. In case you’re not sure what I mean, there’s a helpful image staring right back at you. 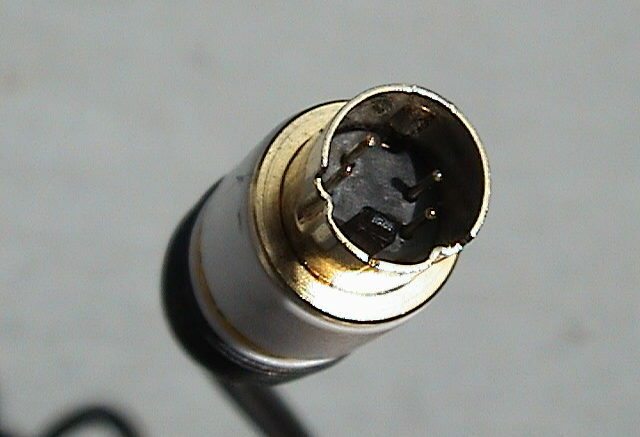 The S-Video connector is special because it uses four wires to carry just video information, meaning that the information is as clean as it can be when it gets to your TV. Most folks would think that it’s carrying the red, green, and blue signal separately but it’s a little more complex than that. As we discussed in an earlier tutorial, the most efficient way to send video is to break out the brightness (the black-and-white part) out and then use two other signals for the “chrominance” or the part that tells you what color is what. The chrominance channel can be only 1/4 of the quality of the brightness and you can’t really tell a difference. S-Video gives you one line for brightness and two lesser lines for chrominance (why two? Long story for another article) plus one ground line. This means the image is a lot better than if you were mashing it all up on one RCA cable. S-Video cables were everywhere in the 90s because when SD is all you can get, you want the best possible. Nowadays no one really cares much about S-Video because if it’s going to be standard definition anyway, do you really care? The story of the S-Video connector is probably more interesting than the connector itself at this point. If you remember the 1980s, you remember VHS VCRs. Everyone had a VCR and everyone pretended that they recorded tons and tons of stuff. In reality most of us actually just rented movies and there were a large number of folks who couldn’t even set the clocks on their VCRs, let alone actually use them to record. You might also remember that there was a small number of people who liked “Beta” over VHS. Beta was the first home video format and a lot of people said with good reason that the quality was better. VHS could record about 150 lines (remember that HDTV is 1080 lines) while “super” Beta could record 300 lines. Of course, you were shelling out about $1,000 for a VCR, and so they had some money to spend on looks. Oh and by the way if I recall it was about $15 for a tape. The problem with Super VHS is that really, no one was actually recording. People rented tapes and they would have loved a little better quality but there were no pre-recorded tapes released on Super VHS. There was, however, one feature of Super VHS devices that caught on: they had what was known as the S-Video connector, and you could only get the maximum quality from them with the S-Video connector. As it turned out, using an S-Video connector actually made regular VHS tapes look better too so that part actually caught on. No one really saw S-VHS recorders (as they were sometimes known) after about 1992, but the S-Video connector… that’s another story.